Geary Corridor looking southeast towards City Hall, c. 1963. The St. Francis co-op is visible around the Buchanan Y (white building) and before the high rise—66 Cleary Court. Two people stand out as exemplary for the creation of the St. Francis Square community as it developed after construction was completed—they are Ruth Maguire and Revels Cayton. The Sales Office opened under the management of Ruth Maguire. Some original members who still live here remember her special efforts to get them approved by the rigid criteria of the FHA, our governing body. At the end of the sales period, Ruth submitted a 47-page report, a sociological document including summaries of how they solicited applicants, attitudes of applicants toward apartment living, toward an integrated co-op, and its neighborhood and schools. It also included reports and charts on “Why Sales Were Lost,” “Racial Composition of Families,” “Ages of Adults—Ages of Children,” “Types of Families,” “Income of Families,” “Residents Occupations,” “Union Affiliation,” and much more. The accomplishment of her sales office, records that the dream of new homes for multi-racial, moderate income families was more than a high-sounding goal, it was a reality. 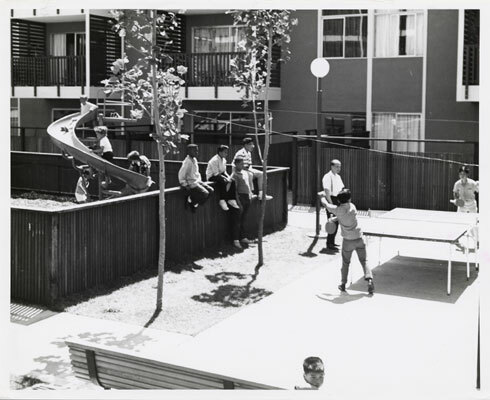 August 20, 1964, children playing at the St. Francis Square Housing Development Play Center. One of her daughters, Susan, came back to the Square with her husband, Fred Pecker, and raised their two children here. Revels Cayton became the first manager. Before the Square was completed, he was busy building ties with the remaining Fillmore community—the schools, churches, the Buchanan “Y” in the middle of the Square. He didn’t bring a great deal of experience in the area of building maintenance, but spent time organizing to build a better community both in the Square and in the surrounding neighborhood. Parents of children at Raphael Weill and Ben Franklin schools were soon encouraged to join the Western Addition Committee for Better Schools. Within the Square, he organized many social activities. The first Sunday after I moved in there was a “Plant Day” when Turner Square was filled with potted plants so the new cooperators could spend a Sunday choosing plants to beautify their decks and gardens while socializing, enjoying refreshments, getting to know one another. Yardbirds, volunteer work parties, began early because when we moved in there was some landscaping, but many areas were unplanted dirt and sand. Work parties almost always ended in potluck lunches and socializing. And 45 years later it still happens. 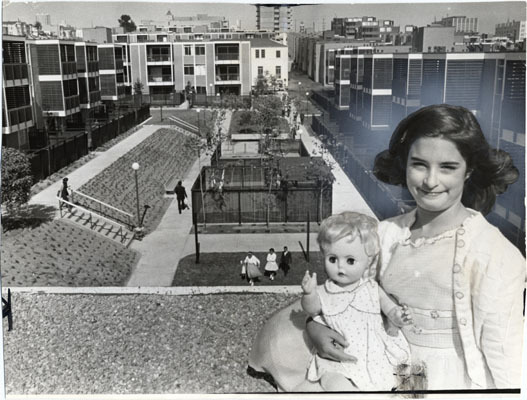 August 7, 1963, Portrait of Julie Solomon with view of St. Francis Square housing co-op in background. Other activities included a Friday night bowling league, Sunday basketball games at the Buchanan “Y”. In 1965, five cooperators participated in the civil rights march from Selma, Alabama. They were supported by other shareholders and friends who collected 500 pounds of food and needed supplies for their march. And many committees were formed. Most supported and reported to the Board of Directors. These committees began early and continue still—Finance, Recreation, Building and Grounds, Elections, Publications, a large number of residents became involved in the co-op’s operations. When I checked several years ago, approximately 1/3 of the families were still involved in committee activity. A great deal of Revels’ social organizing caused controversy. Some thought a manager should limit his work to traditional real estate practices. By our second year, the five members of our Board of Directors became locked in a three-two split. Among the issues of contention were what the duties of a manager should be. With a tremendous effort by many active members, including ILWU members living here, that Board was recalled and a new unified and functional Board of Directors carried on which supported Revels Cayton as manager. This pot-luck picnic was the first of what has become an annual event which continues today. Later, Revels resigned to take a position as Deputy Director of the San Francisco Housing Authority; followed by an appointment by Mayor Alioto to be Deputy Mayor of Social Programs. This was a position which his time at St. Francis Square provided excellent experience. His obituary in Circling the Square 30 years later captures the essence of the leadership and love between Revels and the Square. Revels gave an initial direction, but the leadership which carried on was strengthened by ILWU members including Leroy King, Henry McKnight, Tom Tsukahara, Jack Olsen, Norman Young, Al Lannon, and Carol Schwartz–not a member, but an employee of.... Their leadership and that of many others was committed to making the Square follow the goals of original founders. 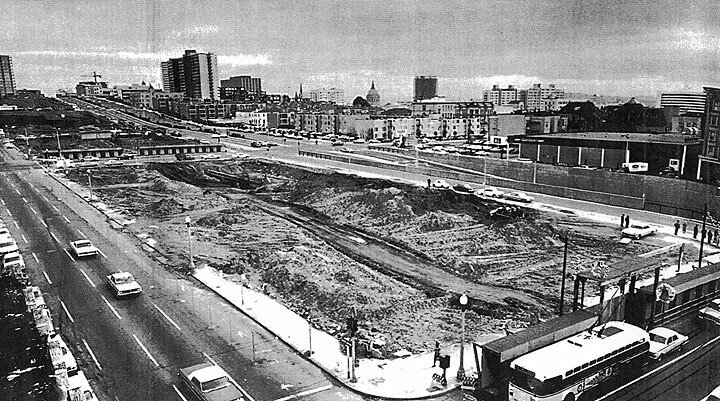 Together with the ILWU, the Square’s influence on the impact of A-2 Redevelopment tried to mitigate some of the worst action of the A-1 Program.